Mega Man has been MIA for years now, with the franchise seemingly disappearing after the release of Mega Man 10 in 2010. Aside from the Blue Bomber’s appearance in Super Smash Bros., Mega Man has become something of a video game hero of yesteryear. It makes sense then, that when a hopeful spiritual sequel was revealed on Kickstarter back in 2013 under one of Mega Man’s original creators, Keiji Inafune, it gained a lot of attention. Not only did this game, dubbed Mighty No. 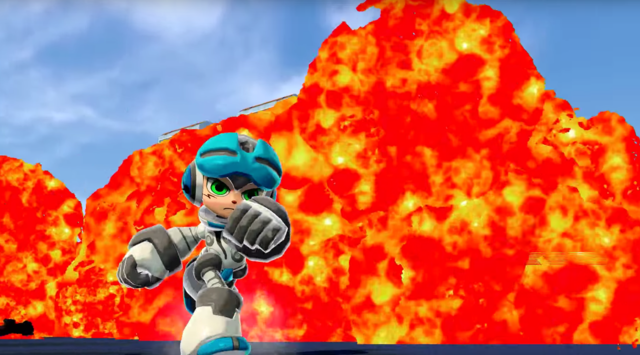 9, reach its crowdfunding goal within the span of two days, but it also promised to be a worthy successor to the Mega Man franchise, filling the large gap created when the series came to an abrupt halt. But that was then, and this is now. After numerous delays, production issues, broken promises, laughable marketing, and a subsequent failed Kickstarter for a spiritual spinoff a la Mega Man Legends by Inafune, reaction towards Mighty No. 9 went from excitement to skepticism. Sadly, said skepticisms weren’t misplaced, because the final result of Mighty No. 9 is a decidedly mediocre disappointment. In concept, Mighty No. 9 looks to have all the trappings of the franchise that inspired it: It features a robot protagonist (named Beck) who runs and shoots his way through different action-packed sides-crolling stages, which are selectable in whatever order the player feels like. There are eight other robot bosses that need to be defeated in order to gain their abilities, with each robot’s power being particularly useful against another like a game of rock, paper, scissors. And the game even tries its hand at a Mega Man level of difficulty. Problems arise, however, when it becomes apparent that all of these connections to Mega Man are all incredibly superficial. In execution, Mighty No. 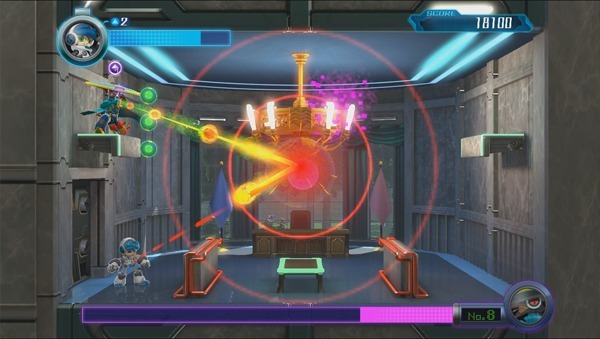 9 rarely understands the finer points of the Mega Man formula that made it work so well. The most immediate issue with the game is the gameplay itself. 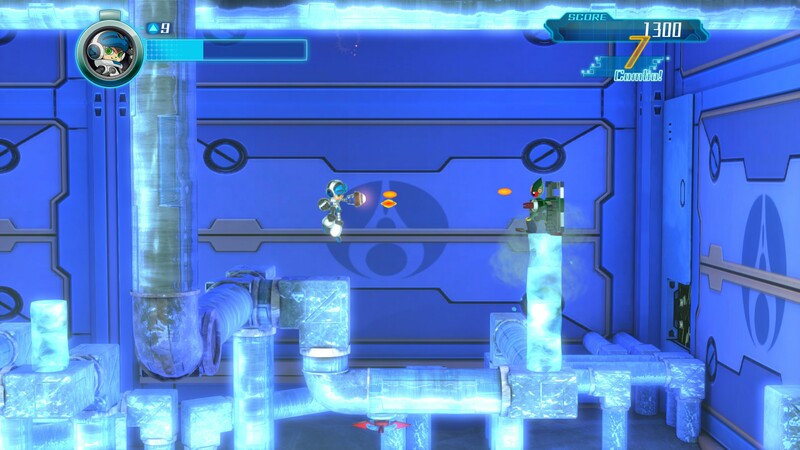 Beck runs, jumps and shoots like Mega Man did, but he moves more sluggishly, and his jumps feel awkward. The level design feels similarly dumbed down, with much of the so-called “challenge” feeling outright cheap and unfair. The placements of one-hit kill obstacles are far more ridiculous than you’d ever see in Mega Man. While the Blue Bomber often faced similar obstacles, there was a sense of strategy with how to overcome them. They felt like intelligent traps that required the player to think. In Mighty No. 9, there were multiple instances where I felt luck played a more prominent role in whether or not I made it passed certain obstacles than strategy or skill. Then there are segments where you have to make your way through with a ridiculous accuracy, as going too slow means you’re stuck until the trap or platforming obstacle resets itself, and going too fast can lead you to losing one of your precious extra lives. It simply breaks the flow of things. On top of that, the levels themselves feel largely uninspired. The majority of Mighty No. 9’s stages feel like they’re just marking a checklist of features from Mega Man titles, without having any distinctly creative means to prevent them from feeling like rehashes. That’s not to say that the gameplay and level design are all bad. A new dash attack is added into the mix, which allows Beck to absorb weakened enemies to rack up points and combos, thereby getting through the level quicker and earning the player a better grade. 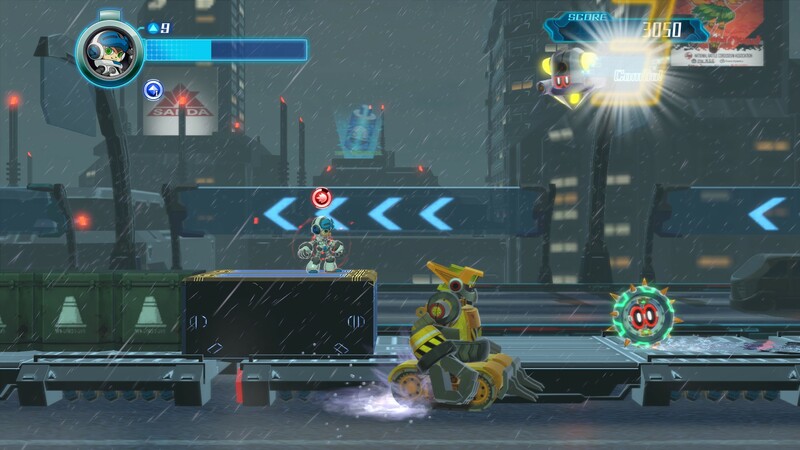 Another fun addition that feels like it could have served as part of the evolution of the Mega Man series is that the boss robots whom you defeat may appear in subsequently played stages, where they may change up the environment by eliminated an otherwise devious situation or two. Meanwhile, two of the stages – one placed on top of the speeding vehicles of a highway, and the other inside of a more open-ended area, where you must continuously avoid the sniper fire of the boss and track him down -bring a nice change of pace to things. On the downside of things, even Mighty No. 9’s good points come with a not-so-good flip-side. The Dash, for example, can be repeatedly used in midair, rendering many platforming challenges moot. Most of the abilities you get from the bosses end up being largely pointless, except when up against their assigned boss, and the ice ability obtained from the fight against Mighty No. 2 practically breaks the combo system, as freezing enemies allows the dash to grant you full points from an absorbed enemy without really trying. The moments where defeated bosses help you out is a good idea in concept, but they feel underutilized in execution. Even the two more creative levels I mentioned are among the shortest in the game, while the more uninspired ones tend to drag on and on. In the game’s defense, it does at least try to give its characters some personality, though it only succeeds so often. I did like the aforementioned sniper boss, Mighty No. 8, who bears a resemblance to Clint Eastwood’s Man with No Name character, and wishes to become the first robot president of the United States. I also liked Mighty No. 6, a helicopter robot who thinks of himself as a newsman reporting from the sky. It’s cheesy, but I got a few chuckles out of it. That charm only applies to some of the characters, however. Beck himself lacks any discernible personality traits other than “he’s the main character,” and the human characters (of which there seem to be too many) are entirely forgettable. And then there’s Call, Beck’s answer to Mega Man’s Roll, who just falls under the anime archetype of the girl robot who acts more like a robot than the other robots. I don’t know if it’s supposed to be cute or something, but it just takes away the potential for another actual character. The cherry on top of this sundae of disappointment is that it just isn’t very pleasing from an aesthetic standpoint. While the original Kickstarter pitched a striking, hand-drawn visual style in the vein of Mega Man 8 brought up to date, the actual game looks like a throwaway 3D action game in a 2D perspective. 2.5D games can look great, as is evidenced by titles like Donkey Kong Country: Tropical Freeze, but in terms of both art direction and graphics, Mighty No. 9 is certainly no Tropical Freeze. Not by a long shot. Even the music, one of the most revered traits of the game’s Mega Man lineage, is largely forgettable. It’s not a bad soundtrack, but when you consider how often the tunes of Mega Man would get stuck in your head in the best way, and Mighty No. 9 looks to emulate the series so closely, the fact that I can’t even hum any of the game’s music by heart is a big letdown. In the end, Mighty No. 9 has some moments of fun, and even some novel ideas that, in concept, sound like they could have made sense as an evolution of the Mega Man formula. The problem is that, in execution, Mighty No. 9 continuously stumbles. Its better ideas feel underdeveloped, and its lesser ideas feel like cheap, lazy knockoffs of its inspiration. Thinking about what Mighty No. 9 originally promised and what it ended up being is so disappointing, it may leave you crying like an anime fan on prom night. Man, I can’t believe how badly this game is doing. It’s interesting how the one feature I was looking forward to, the dash, seems to be yet another pitfall, making it too easy to float. Yet, apparently the game is sluggish without it? Yikes, how did Comcept get it all wrong. Did they not have the rights to just completely copy Mega Man’s gameplay? Haha. I enjoyed reading your review! Shame that Mighty No. 9 has performed so poorly for most people though. And to think I was, at one point, excited about that game. I am glad I did not join the Kickstarter campaign and I sure hope its failure won’t stop people from backing other titles. It is sad to see that during an era where so many sidescrollers are finding way to be creative and engaging, Mighty No. 9 does not check any of those boxes. Yeah the game just seems to be the very definition of disappointment. A very good analysis on your part and pretty much covers everything that one would need to know. I have never actually completed a Mega Man game before… I have Mega Man 2 on my 3DS but I never extensively given it its rightfully deserved time so you can add that to my never ending list of games I need to play. I guess for those who wish to play a Mega Man successor, they can dive into the excellent Shovel Knight which seems to be truer to the Blue Bomber’s legacy than this ugly disappointment. It’s slightly weird, I find that I only review good games because I simply don’t want to spend money on a mediocre title, so I usually wait to see a game’s general reception before putting my money down. That being said, I feel that my reviews lack that diversity as they are predominately littered with endless praise. I also want to review a game or two that fairs on the mediocre side of things so I can have a change of pace in writing. Yes, Mighty No. 9 joins the ranks of my the most disappointing games I’ve ever made (I may make a list of that soon, but probably just top 5. I don’t want to depress myself too badly). You should definitely give the Mega Man games a try. They’re classics for a reason.